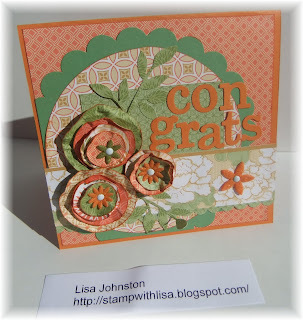 This week at Just Add Ink the challenge is to just add patterned paper. Now I love my Designer Series Papers so I knew this would be a challenge I would really enjoy. For my card I used the Haiku Designer Series paper. The flower embellishments are made by layering different sized circles that have been punched from the paper, scrunched and inked. I have added some Felt flowers as well. The sentiment and leaves have been diecut with my new favourites Timeless Type and Little Leaves for the Big Shot. The Green scalloped circle is a Carousel Note from my stash of retired product. Thanks for stopping by and don't forget the challenge is open till Midnight Wednesday so you still have time to enter. 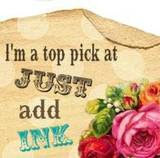 Edited to add: My card was picked in the top 5 this week at Just Add Ink .... I am an excited little vegemite. WOW - the flowers are stunning and with the colours it all just works doesnt it!!!!!! Love what you have done with the dsp this week. Very balanced.